Love can thaw the fiercest winter.In a society where elves are no longer creatures of myth and magic, Brynne Mirren is just trying to survive the holidays as one of Santa’s Rejects. Loyal to her duty as the eldest child, she stands outside in the freezing cold and sell matchbooks—not that anyone would buy anything from an elf. Each fruitless day is the same without exception until her path crosses with Carter Holly. Persistent though he is, she can’t help but wonder if he has an ulterior motive.After all, very few humans look kindly on elves these days.Days before Christmas, Brynne’s life takes a drastic turn and she is forced to trust the gentle stranger in the darkest time of her life. 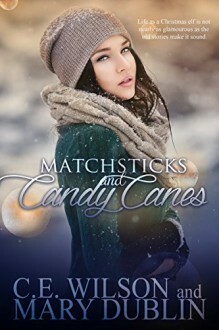 Carter Holly continues to surprise her, stirring up new feelings within her with every act of kindness.Though the threat of freezing along with her matchbooks is very real, Brynne can't forget that falling in love with a human is even more dangerous.Matchsticks and Candy Canes is the first book co-written by C.E. Wilson and Mary Dublin. http://lorimurray.booklikes.com Lori's Little House of Reviews. 4.0 Really enjoyed the book. Nice book to read for the Christmas holiday. text Really enjoyed the book. Nice book to read for the Christmas holiday.